The date of the closing on the sale of my condo is about a month and a half away now and I still haven't found a new place. I have, however, apparently gotten pretty good at picking out places that are about to sell. So far, about half the places I decided to look at ended up selling a day or two before I got a chance to look at them. The big decision I really need to make is whether to buy a house or a condo. I lke the idea of having a house with my own bit of land, but there are some drawbacks to this. I am seldom home, so I wouldn't really get mouch chance to enjoy the land, and having a house and land means I'd have to spend time on upkeep and maintainance - and I don't have a lot of free time. Plus, a house costs at least $100,000 more than a condo (at least the ones I've been looking at). An extra $100K for a mortgage equates to about an extra $500 per month in a mortgage payments. A condo has monthly condo fees - lets say they're $200 (on the high side), so, owning a house would be costing me an extra $300 a month (well, taking into acount the higher taxes, its probably a bit more - maybe the difference should be $400). Is it worth having my own house with a bit more open space for an extra $300 or $400 each month? I don't know... It's not like I need the space and land I'd get with a house. Hopefully I'll make a decision this weekend. Last fall I had purchased a lens for my camera. The lens is made by Sigma and is a 24-60mm 1:2.8 EX DG D. When I first bought it, I really liked it. With support for f/2.8 through the whole zoom range, I could get away with taking pictures in fairly low light situations. About 2 months ago I noticed some of the photographs I took with the lens were slightly out of focus. I did some testing and it turned out the lens had a back-focus problem. When in auto-focus mode, it was focusing slightly behind the place it should. This led to pictures that were not sharp. The lens is under warranty, so I sent it in for repair back in February. For the past few weeks I had been expectantly opening my mail box hoping my lens would be back from repair. Well today it did come back, and at first glance, it seemed like the focus problem was fixed. However, I had an unpleasant discovery after testing it for a few minutes. Apparantly the electronics inside the lens were replaced with the wrong part - the lens now thinks it is a 24-60mm f/3.5-f/5.6. It no longer supports f/2.8! This is a very bad thing since an f/3.5-f/5.6 lens is about 1/3 the price of an f/2.8 lens. Now I have to send the thing back again and potentially wait another month for it to get repaired. So if you've been wondering why I haven't been posting many photos lately, this is why. My main lens (this bum Sigma one) was in for repair and I only had my larger telephoto lens available. Oh well, at least I get to practice being patient. Hurrah! It's been 7 months without being able to do any significant practice at home. I sorely missed it. 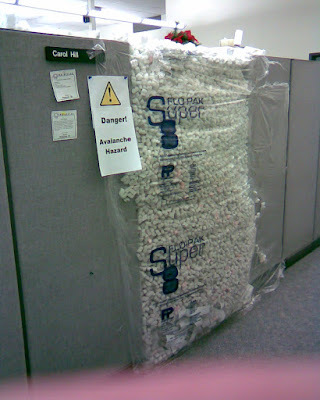 Since we didn't want to have to spend hours cleaning up when the person returned, we didn't actually fill her office with foam peanuts. We faked it. The layer is only about an inch or two thick - we put a partition behind it to hold it all in place. Fortunately, the woman whose office this is is fairly short, so she could not see over the top to see the inside was actually empty. I took advantage of the extra hour of daylight today and took a small tour of northern Rhode Island to do some drive-bys of houses for sale. 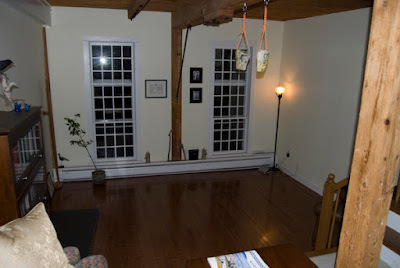 The plan was look at 14 houses in 6 towns (Scituate, Foster, Johnston, Glocester, North Smithfield, and Cumberland). I got a somewhat late start and didn't get on the road until 4:00, but still managed to see at least 10 of the houses (I never made it Cumberland). After seeing some of these places and the prices people are asking, all I can say is I think whomever bought my condo got a pretty good deal! People sure are asking a lot of money for very little in way of land or house. Everything I saw that seemed to be a decent price had something seriously wrong with it and houses that didn't have anything obviously wrong seemed significantly over-priced. It looks like my tent idea is getting better and better. Out of the 10 houses, there were a couple I might make an appointment to see. But, I'm glad I took the time to drive by them all first before making any appointments - on paper they all sure looked a lot better. My ipod had recently been giving me grief (it refused to stay on), so for my rides home at night I had been listening to WGBH on the radio. The evening program on weeknights is a jazz program called "Eric in the Evening". A lot of times on his program he'll have some local artist live in the studio with him. It's an interesting program - he'll talk a bit with the artist, then play some music by the artist, then talk some more, etc. It lets the listener get a nice idea of the artists background, their motivations, and of course hear what their music sounds like. These past couple weeks there were two different guests on the show that really stood out for me and I liked enough to order a CD from each of them. Today when I got home, one of the CDs I had ordered was waiting for me in my mailbox. It's a CD from Marta Gomez. I think it's very good stuff. Having no musical talent of my own, I won't even attempt to describe her - you're better off going to her web site and listen to some samples if you are interested. All her songs are in Spanish (she was born in Columbia), so I currently have no idea what most of them are about - except for the ones I heard on the radio program where she described them. Rather than include a word-for-word English translation of the lyrics, the liner notes included with the CD have brief descriptions in English of what each song is about. Marta had read one of the descriptions (of the song titled "Who will remember me?") on the radio program and it just struck me as such a melancholy song: "This is a story of a man who works cutting sugar cane every day, as many men and women do in the world. He wakes up very early, when it's still dark, and walks many miles to the fields. He prefers singing and counting stars than thinking why he is there and what happened to his dreams, or asking himself: 'who will remember me?'" The second CD I ordered is from Bernardo Monk. I haven't yet received it, but I heard quite a bit of his music on the radio program and really enjoyed it. To me it sounds like a cross between tango and gypsy music. It's very fun! Your CD has been gently taken from our CD Baby shelves with sterilized contamination-free gloves and placed onto a satin pillow. A team of 50 employees inspected your CD and polished it to make sure it was in the best possible condition before mailing. Our packing specialist from Japan lit a candle and a hush fell over the crowd as he put your CD into the finest gold-lined box that money can buy. We all had a wonderful celebration afterwards and the whole party marched down the street to the post office where the entire town of Portland waved "Bon Voyage!" to your package, on its way to you, in our private CD Baby jet on this day, Sunday, March 4th. I hope you had a wonderful time shopping at CD Baby. We sure did. Your picture is on our wall as "Customer of the Year." We're all exhausted but can't wait for you to come back to CDBABY.COM!! Since I bought a new car, I am now reading the 400+ page owner's manual. So far, I've run across a few entertaining items. For example, when describing the inside door levers that open the door, the manual helpfully notes to not pull the lever while driving as the door will open. Duh! In another case, the manual was describing a feature of the power windows and how for safety they will detect an obstruction when closing and will automatically reverse. Being the curious sort, I immediately thought of testing this on my hand - hey if it's a safety feature, it ought to be safe - but the manual has a bright yellow warning block that explicity says to not try to test this with any bodily parts as it could cause injury or death! Well, so much for my bright idea. In another section, there are some drawings of proper and improper ways to configure child seats (called "child restraint systems" or CSS in owner's manual lingo). In the drawings of the children, the children in the improperly configured CSS actually have small X's for eyes to show they've been killed! Yikes! In the properly configured CSS drawing, the child is all smiles and has normal eyes. The car is a 5-speed automatic with overdrive. The overdrive feature allows the driver to force the engine to downshift to lower gears - 4 through 1 - to use engine breaking, which I had assumed was useful for going down hills. But, there's a chart listing the speeds at which you should use the overdrive. While the choices are from 4th gear down to 1st, the chart says you should only downshift into 3rd gear when the vehicle drops down to a speed lower than 100 MPH. When the heck would I be driving faster than 100 MPH?!?!? And if that is true, when would I ever downshift into 4th gear? For speeds greater than 100MPH??? Does this mean I'm never even using 5th gear since I never expect I will be driving faster than 100 MPH? Another section describes the seat belts. It mentions a personalized seat belt extender is available free of charge "if your seat belts cannot be fastened securely because they are not long enough." That's some very polite wording - it's a problem with the length of seat belts, nothing else. On Friday I bought a new car and traded in my old Highlander. The new car is a 2007 Toyota RAV4. As expected, the car buying experience dealing with salespeople was somewhat unpleasant. I really liked the day back in 1995 when I bought my Saturn. But what's not to like about a place where they don't haggle on the price, they take your picture when you buy the car, give you a cheering send-off with all the salespeople gathered 'round and they even post your picture on the wall of their dealership? I know the no-haggle policy probably doesn't lead to the best prices for the consumer, but I really liked the fact that Saturn just has a set price for the car - same as how you buy most other items in life. There's no haggling involved. But I wasn't buying a Saturn this time, so the haggling was unavoidable unless I wanted to pay several thousand more than I needed to. On Tuesday during lunch I went to a local Toyota dealership close to where I work to see the RAV4 in person. Since it was smaller than my Highlander I wanted to make sure the size was appropriate for my needs. I had read about the volume of storage space and compared it to the volume listed for my existing car, but on paper I honestly couldn't tell whether having 8 less cubic feet of cargo space was really going to be a big deal. When I got to the dealship and saw the RAV4s parked next to the Highlander I actually had a hard time telling them apart. Even the salesman did, too. From the front, the two vehicles look very similar. The 2007 RAV4 design looks like a slightly smaller Highlander. I was specifically looking for a RAV4 with a sunroof, and there were a few instances where either I or the salesman would point at a car and say, "Oh, there's one with a sunroof!" only to discover a few seconds later that it was a Highlander, not a RAV4. In the end, I wasn't able to find a RAV4 at this dealership that had the options I wanted. But, it was just as well. The salesman struck me as an odd fellow. While talking about the car, he would often mix in swear words in his descriptions. He would say things like, "This car has <bleep>ing great exceleration." I was a little taken aback on this. It wasn't like he just did it once or twice. He was talking to me like I was his drinking buddy at the local tavern. I wasn't sure if since I look young he thought I would appreciate some "straight talk" about the car. But anyhow, it wasn't the most professional presentation. So, I was kind of happy they didn't have the model I was looking for. On Thurday morning I drove past another Toyota dealership on the way to work, so I stopped in to see what they had. I had emailed a salesperson the night before to verify they had a RAV4 that matched what I was looking for. I figured I'd just spend a few minutes there to get an idea whether I really liked the car. As it turned out, I ended up spending over an hour there! I had forgotten the key point from Car Sales 101 - if you have a customer on the premises, do everything you can to prevent them from leaving without signing a deal. (More on that later...) Anyhow, I test drove the RAV4 and unlike the previous dealership, this salesperson was much more professional. He explained the features of the vehicle much more thoroughly and only once resorted to swearing. I guess it must be a trend in car sales to cuss while talking with the customer because even the general manager resorted to it later on. But I'm getting ahead of myself. After looking over the car and test driving it, the salesman asked me if I was going to be trading in a car. I said I would and he offered to do an appraisal on the spot. I asked how long it would take because I was on my way to work and he assured me it would only take a few minutes. And that's when I made a mistake. I believed him and gave him the keys to my car. As it turned out, the appraisal really did only take a few minutes, but once they had me sitting down in the office, the salesman and general manager team tried to work their sales magic. The salesman brought over a piece of paper which had the trade-in appraisal value for my Highlander written in large black magic marker, plus a bunch of other boxes with other numbers written in large black marker. I guess large black marker is supposed to make the numbers look more impressive or something. Anyhow, the other numbers included things like the price they were offering to sell the car (which happened to be exactly the same as the MSRP. Gee, what a deal!) and what my monthly payments would be. The salesman then eagerly asked, "So, what do you think? Is this a good price? Do you want to buy the car now?" I explained to him that this was the first dealership I had gone to for a quote and I didn't really know whether the price was good or not. I would have to research it a bit and get some more quotes. He then left and talked to his general manager who was only about ten feet away and so I could basically hear their whole conversation, which I assume was intentional. The GM said something like, "That's bull <bleep>! If you let him leave here he's just going to go to the dealship near his work and get a better deal there." I was kind of shocked by the GM's language - I guess I'm naive about what's considered professional behavior in the world today. So, after more of their conversation, the sales guy came back and asked me again what price I would be willing to pay - and I again told him I honestly didn't know. I repeated the fact that this was the first place I had gone to for a quote and I wanted to get quotes from other dealers. He also had helpfully added more numbers in large black marker to the paper - now including lower monthly payments for getting longer term loans. I explained to him the problem wasn't the amount of the monthly payment - it was the overall price. And I couldn't make a decision on the price until I got other quotes. The salesman then left again to talk with his GM, and came back again and told me his GM said to tell me that "He doesn't want to not sell me a car." I had to repeat that a few times to myself to make sure I understood what it meant. I assumed he was trying to be clever because the motto of this dealership is "We want to sell YOU a car!" I again told him that I had to get other quotes. He left again to talk with his GM, again coming back and suprisingly still not offering to budge on suggesting a lower price, but instead repeated his request for me to suggest a price. I found that odd that he wouldn't even suggest a lower price even if it was some petty amount less than list price, but I suppose from his point of view it makes perfect sense - if he can get me to suggest a price he can then work up from there and I can never suggest a lower price. Finally, I told him it was past 9:00 and I was late for work and really had to go. He told me that after I got quotes from other dealers to please come back and he would do his best to gain my business. He also told me that his GM wanted me to know that they strive to "make dreams come true" or some other foolishness like that. I guess since I mentioned I worked within walking distance of another Toyota dealership that they assumed I would not be buying from them since the other place would be in a more convenient location. Anyhow, I ended up finally leaving around 9:10am. After that whole experience, while driving to work I started thinking maybe I should just keep my existing car. That's about the time I made my previous post about thinking of getting a new car. You can read more about my thoughts on that here. On Thursday night I did some more research on the car and what was considered a reasonable price. I bought the Consumer Reports car buying guide for the RAV4 and checked Edmunds.com to see what was considered a reasonably priced offer from the dealer. From what I saw on Edmunds, the RAV4 appeared to be a popular car and a price only a few hundred under MSRP list price was considered a good deal. After reading that, I was tempted to contact the dealer and make a counter offer of what I thought was a fair price. But instead I did some more research. I ended up contacting a couple other Toyota dealers in the area and asked for price quotes on a similarly equipped RAV4. Surprisingly, on Friday one dealer (the one with the <bleep>ing odd salesman) gave me a quote only a couple hundred dollars over dealer invoice! After what I had researched so far, that seemed like a great price. It was $2000 less than what Edmunds suggested was a good price! So, I forwarded the quote to the dealer who didn't want to not sell me a car and asked if he could match the price. I expected him to say no, but instead he called me back and said he would match the price and if I wanted I could pick up the car that same night! I agreed to the deal and I am now driving a new RAV4. In just two days I've already put about 300 miles on it. I guess I do a lot of driving. So far, I am very impressed with the car. The storage space is much more than I initially expected, especially since there's a whole hidden area under the normal cargo area - large enough to hold a suitcase. This is where on most cars the spare tire is stored. On the RAV4, the spare tire is attached to the outside of the car on the rear swing-out door, so you get this bonus storage space. Plus, if you have extra large or long items, there are two levers accessible from the back hatch that with one quick pull cause the back seats to auto-magically fold forward, providing a much larger cargo bay. Granted, many hatchback cars support folding the back seats down to get more space, but putting a second set of levers right inside the back hatch area makes it mighty convenient. The car drives like a rocket, and I'm not normally one who drives fast. I've been accused on several occasions of driving like an old man. Today I accidentally found myself driving over 80 MPH when I thought I was only going about 60. I had read that the acceleration of the car was quite good (0 to 60 in 6.7 seconds, or something like that) so as a test on an on-ramp to the highway I figured I would see how long it took me to get up to highway speed. Weee!!!! I felt like I was on an amusement park ride! Driving a car shouldn't be so much fun. I could get in a lot of trouble with this thing! Now I see why people like cars with powerful engines. This small SUV has a 269 HP engine. When I was originally looking at the RAV4 at the dealership, I asked the saleman what the difference was between the V4 and the V6 and he said it was a 100 horsepower difference. I thought he must have been exaggerating since the V6 only gets 1 MPG less than the V4. But I double-checked on Toyota's web site and it's true - the V6 gets 28 MPG and the V4 gets 29 MPG and there is a difference of 100 horsepower. For any reader who is a gear-head, here are the stats on the engine. It's all Greek to me, but I figure someone will be interested: 3.5-liter DOHC 24-valve SFI Dual VVT-i V6 269 hp @ 6200 rpm/246 lb.-ft. @ 4700 rpm. This engine is actually more powerful than what was in my larger Highlander. I don't notice much different in the handling with the RAV4 vs. the Highlander. The ride seems pretty much the same to me and I thought the Highlander rode quite smoothly (much more like a car than a truck). The only different I found was the RAV4 might be a little more noisy than the Highlander. I seem to notice the sound of the engine and the road a bit more. The only thing I don't like about the RAV4 (and this was the one "neutral" mentioned on Consumer Reports as well), is the quality of the sound-system. It has a six CD changer (which is a good thing), and even has a handy stereo jack input for an MP3 player in a hidden console between the driver and passenger seat (again a nice feature), but the sound is just dull. It seems like the stereo is underpowered, or the speakers are really poor quality, or something. The sound just isn't crisp. By default, the bass seems a bit overwhelming - I had to turn it down to -4 before it sounded more reasonable. It's not like the sound is terrible, but I wouldn't call it good, either. And with the amount of driving I do, I tend to listen to music on the car stereo a lot, so this was a little bit of a disappointment. But, the stero can always be replaced, and it's not like I bought the car for the sound system. I bought the RAV4 for the reliability of transportation and on that side of things I am currently quite pleased. Sadly, no lunar eclipse viewing for me tonight. It was a beautiful clear sunny day - until about 4:00. Then the clouds came in. Parts of the night sky are clear now directly overhead, but the moon is on the horizon and there are still all clouds there. Oh well, maybe next time. Hopefully it's not a few years away. For the past few weeks I've been debating whether to buy a new car. My current car is about six years old and has about 140,000 miles on it. I like the car - it's a Toyota Highlander - and it's in pretty good condition cosmetically. Also it has never had any problems, however it is starting to show it's age. Lately it has started to burn oil at a fairly rapid rate and the gas mileage has dropped to about 18 mpg (from a high of about 23 that I used to get when it was new). Those two things combined make me feel a bit guilty about the amount of driving I do and its effect on the environment. Plus, as time goes on, I will eventually have to buy another car (nothing lasts forever - not even Toyotas), so I'm thinking it might be better to trade this in while it still has some decent value left in it. So, I'm now trying to figure out what is best to do - spring for a new car and do the environment a favor - or save the money and continue to drive my polluting aging car. And if I do buy a new car, what kind should it be? I really like the new model RAV4 from Toyota - it gets a lot better MPG (up to 29 on the highway) and is a 4WD. It has a bit of storage space for the stuff I tend to tote around for outdoor adventuring. Plus, it gets great ratings from Consumer Reports. But, 30 MPG still isn't that great. I could get one of those hybrid cars that get gas mileage in the 50's. The main drawback for me with something like that is I am looking for something with 4WD and a bit of storage space. There are 4WD hybrids, but all the ones I've seen are ridiculously expensive and the gas mileage isn't really significantly better than what I would get with the RAV4 (and in some cases it's worse!). What I'm finding at the root of all this is this is really a drawback of being single. I really need it to be married. Then I could justify having two cars - one small super fuel efficient one for day-to-day commutes and another slightly larger 4WD one that doesn't get as much day-to-day use with lots of mileage, but can be primarily used for the weekend outdoor adventure stuff. Hmmm... now that I think about it, I guess I don't really have to be married to have two cars. For the cost of a wedding I could easily buy that second fuel efficient car. Addendum Friday 3-2-07: I just found a really good deal on a new RAV4 and bought it. I'll post more details about it later.